Record heat, affecting much of the nation this summer, contributed to greater use of natural gas to generate electricity. Of the 25 days since 2005 with the highest estimated use of natural gas to generate power, six occurred between July 20 and August 3 of this year. In late July 2011, four Regional Transmission Organizations—Midwest Independent System Operator (MISO), the PJM Interconnection (PJM), the New York Independent System Operator (NYISO), and ISO New England (ISONE)—broke or neared peak day demand records. ERCOT, the electric system operator for most of Texas, set repeated load records during the first week in August. 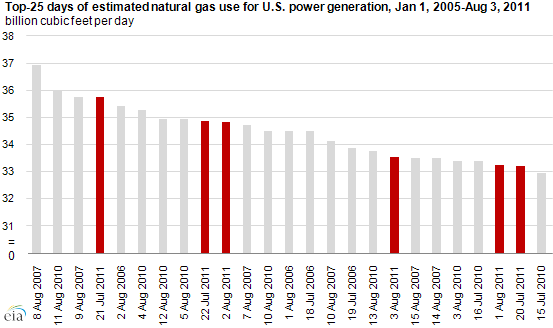 Natural gas use for power generation (see chart below) has topped the 5-year range (2006-2010) on about one-quarter of the days so far in 2011 (January 1 through August 4). Extremely cold and hot weather, lower nuclear generation due mainly to planned outages, and lower wholesale natural gas prices contributed to increased gas use for power, up about 116 billion cubic feet or 5% during the first five months of 2011 compared to the same time period in 2010. 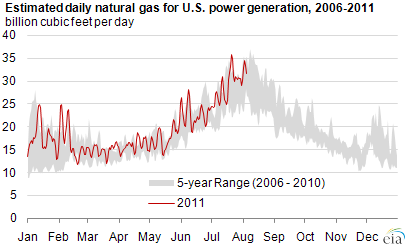 Trends in 2011 are part of a longer pattern of greater reliance on natural gas use for power.